Most years our Christmas liturgy at St. Philip’s begins with the processional hymn, O Come All Ye Faithful. Along the way the procession stops at the creche to place Jesus in the manger and offer prayers. This year we will first hear The Proclamation of the Birth of Christ and then begin the processional hymn. The Christmas Proclamation as it is sometimes called comes from the Roman Martyrology. It is usually read on Christmas Eve before the Midnight Mass. The proclamation sets the birth of Jesus in relationship to events of the Old Testament as well as the Greek and Roman worlds. It is a way of dating Jesus’ birth different from modern dating systems. The National Catholic Register offers a helpful explanation of this method of dating. The introduction to the proclamation comes from the Diocese of Crookston. There are several versions and translations of the proclamation. The proclamation below contains a few changes, clarifications, I made based on the different translations. Throughout the season of Advent, the Church has reflected on God’s promises, so often spoken by the prophets, to send a savior to the people of Israel who would be Emmanuel, that is, God with us. In the fullness of time those promises were fulfilled. With hearts full of joy let us hear the proclamation of our Savior’s birth. Jesus Christ, eternal God and Son of the eternal Father, desiring to sanctify the world by his most merciful coming and loving presence, was conceived by the Holy Spirit, and when nine months had passed since his conception, was born of the Virgin Mary in Bethlehem of Judea, and was made man. Thanks for the Christmas Proclamation – I like the ‘tweaking’ of parts of it, and will use here in Kingston SE, Sth Australia, this Christmas. Fr. David, I will remember you and your parish as we hear the proclamation at St. Philip’s. Christmas joy and blessings to you all. Narelle, so glad you hear the awe in the proclamation, me too. It reminds me that God is stirring and history is active, almost as if those are the world’s contractions, labor, to bring forth the birth of Jesus. 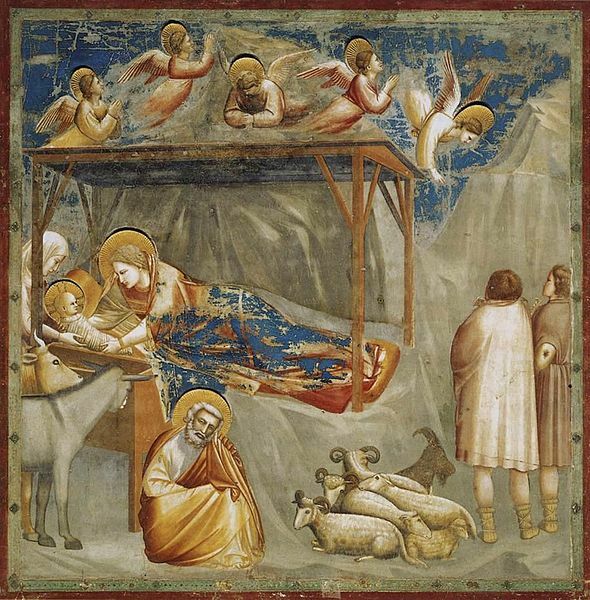 And thank you for the very beautiful Giotto painting. It is really nice. I sort of stumbled on to it and glad I did. Thank you Jan. Merry Christmas!